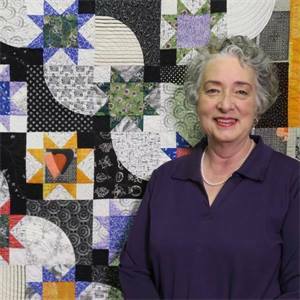 American Quilt Retailer is pleased to welcome Pepper Cory as our AQR blogger. Her vast knowledge of the industry and her business approach will be a great addition to our team. Our goal is to provide another opportunity for quilt shop owners and industry professionals to communicate with each other. We’ll be working to make this blog a useful resource for you. Read on for Pepper’s first blog post. When the opportunity to write the blog Piece by Piece for American Quilt Retailer presented itself, I was intrigued. Sure I’d written blogs before but they were purely for personal interest. In my occasional posts on the blog Quilt Flap I chat about unusual antique quilts. When there was enough interest out there that I would be challenged to take more photos and in a month or three, write again. I wrote about teaching and my own quilting efforts-with an interesting family story thrown in here and there-in another blog called Pepper at the Quilt Studio. I viewed both my blogs as sporadic commentary on what interested me. If anyone who read the blogs cared to leave a comment that was cool. But writing a blog for a business is a different breed of cat. One might even pose the question, “Why should a business write a blog?” When I delved into the subject, I realized there are numerous benefits to writing a business blog. I hope that in the future you as blog readers and shop owners will be able to relate to what I write, comment and communicate with AQR, and find in Piece by Piece some useful and thought-provoking snippets of information. ‘Snippets’ might seem an odd word to describe the content of this blog but that nicely sums up the first rule of blog writing: keep it simple, interesting, and to the point. Blogs deliver straight-to-the-reader information while at the same time a reader can use the blog as a channel of information back up the pipeline to the publisher by leaving a comment. As a blog writer, you can learn about your viewers by checking your blog’s analytics. What’s that? Analytics are the statistics about your blog. They tell you how many people view your blog and which operating system your readers use (such as Windows vs Apple vs mobile phones). You’ll learn which topic lit a fire so that you can write better and more interesting content. And if you know how your viewers access you, you can design a smoother delivery, as in a simpler blog design that a phone user will appreciate. And face it: search engines (such as Google) love blogs! Topics in your business blog, links to other websites, the photos on your business blog—all go out into the sea of information on the internet and get quoted and re-quoted and then linked back to both your blog and business website. But the thing I love best about blogging is that it gives your business a personal voice. This blog Piece by Piece will come out every two weeks. We will bring you timely industry news and give you the “back story” on topics you first read about in articles in American Quilt Retailer magazine. We’ll pose some questions about our industry and give you a heads-up when our whiskers tingle and we sense a trend building. But most of all, we want to hear from you. Consider this your personal invitation to write to American Quilt Retailer and tell us the topics that interest and concern you.